Thousands of villagers returned to ash-covered homes along the slopes of Mount Merapi, Indonesia‘s most volatile volcano, today, after some areas appeared to be no longer at risk of another eruption. The notoriously unpredictable volcano, in the centre of Java, roared back to life on 26 October, killing at least 259 people in a series of eruptions, according to the Indonesian national disaster management agency. Merapi was still rumbling and spewing searing ash and debristoday, said the state volcanologist Dr Surono, but activity has dropped sharply in recent days. After spending nearly three weeks in crowded emergency camps, the villagers had headed up Mount Merapi loaded down with mats, blankets and clothes, only to find that almost everything they owned was gone, said Lilik Sujati, the chief of Jati, a village on Mount Merapi. The Indonesian government has responded to the slowdown in volcanic activity by reducing the “danger zone” on the northern and western flanks of the crater from 12 miles to six miles. That has allowed some of the 390,000 evacuees to return home. Merapi was still rumbling and spewing searing ash and debris Monday, said state vulcanologist Surono, but activity has dropped sharply in recent days. Boyolali (ANTARA News) – A few thousand monkeys had moved from the slopes of erupting Mount Merapi to those of Mount Merbabu in Central Java Province over the past week, a villager said. Parto told ANTARA News on Thursday that the exodus was likely triggered by the eruptions` impacts that had threatened those animals` food reserves. This 80-year-old resident of Blumbangsari hamlet, Samiran village, Selo sub-district, Boyolali district, Central Java, said he always saw the monkeys crossing his village`s streets to the Mt Merbabu slopes. Parto said those brown monkeys moved from their original habitat on the slopes of Mount Merapi to Mount Merbabu because they might have got problems with food reserves as a result of volcanic ash. The monkeys were also likely unable to keep living with the heat of the smoldering Mount Merapi`s hot clouds of ash and lava, he said. “The monkeys have been seen moving to the Mount Merbabu`s slopes over this past week. They cross the main road of Selo-Magelang route which has been part of the mountain`s areas,” he said. Another villager named Slamet Sutanto, 40, said he also saw the exodus of Mount Merapi`s monkeys on the main road. Many crossed the road on their way to the Mount Merbabu`s slopes. Those monkeys ate remaining fruits and vegetables available on the left and right sides of the road, he said. According to Head of Mount Merbabu National Park Dulhadi, the exodus of Mount Merapi monkeys was triggered by the running out of food stocks in their habitat. 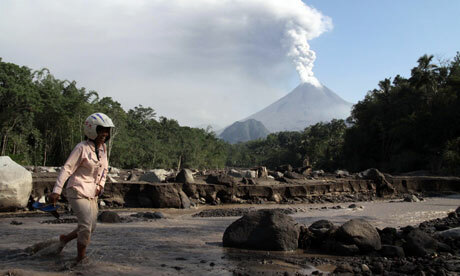 The heat of Mount Merapi`s hot clouds also forced them to find a new habitat, he said. Mount Merapi, located on the border between two provinces, lies geographically close to Yogyakarta but is officially part of Central Java. 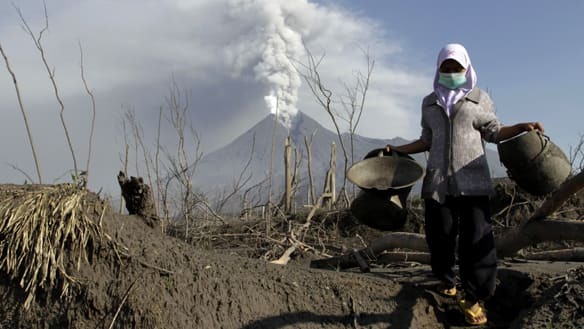 Besides killing and injuring several hundred people, the Mount Merapi eruptions had also damaged 867 hectares of forest on the volcano`s slopes in Sleman District, Yogyakarta, with the losses estimated at Rp33 billion. 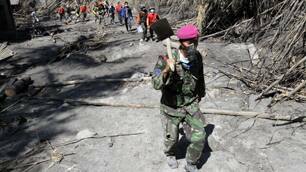 The damaged forest areas consisted of Mt Merapi National Park, community forests and local people`s plantation areas. Animal activist Daniek Hendarto said volunteers were providing animals with food and water. “We want to make sure the animals in the [20-kilometer] exclusion zone survive,” he said. Pyroclastic flows, Sartono said, had also destroyed Javanese eagle nests in Kinahrejo and Kaliurang forests, forcing the birds to leave the area. The sight of two leopards has also created panic among residents of Kemput village, in Sleman, 11 kilometers from Merapi’s crater. They said they saw the big cats approaching cow sheds. “It looked like a mother and her cub,” said Sokidi of Kemput. Several residents have remained at their village to guard their livestock, ignoring calls to evacuate as the village lies deep within the exclusion zone. BKSDA and the management of Yogyakarta’s Gembira Loka Zoo announced plans to catch the leopards alive so they could be released later when conditions returned to normal. Sartono said the BKSDA had also saved some wild animals, including an eagle. Animals endemic to the area, including the Javanese eagle, deer and birds, have also moved, but it is unclear to where, he added. The eruptions are also believed to have changed the migratory patterns of certain bird species such as the Chinese sparrowhawk, besra, Japanese sparrowhawk and oriental honey buzzard. “Before the eruptions I spotted some oriental honey buzzards over the area. I haven’t seen any since the eruptions,” bird spotter Chrismawan said. The overall death toll in the past three weeks stood at 259 with more than 500 people injured. 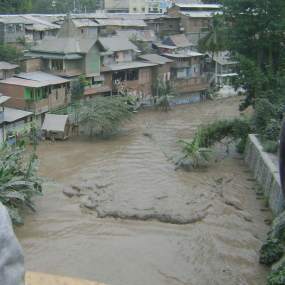 Many people were still missing in several hamlets, officials said. I got a lot of funny looks ten years ago when I started talking to people about Wikipedia.Let’s just say some people were skeptical of the notion that volunteers from all across the world could come together to create a remarkable pool of human knowledge – all for the simple purpose of sharing. A decade after its founding, nearly 400 million people use Wikipedia and its sister sites every month – almost a third of the Internet-connected world. It is the 5th most popular website in the world but Wikipedia isn’t anything like a commercial website. It is a community creation, written by volunteers making one entry at a time. You are part of our community. And I’m writing today to ask you to protect and sustain Wikipedia. P.S. Wikipedia is about the power of people like us to do extraordinary things. People like us write Wikipedia, one word at a time. People like us fund it, one donation at a time. It’s proof of our collective potential to change the world. Donate Now · Show Your Support · Share Your Story · Stories · Questions? All credit card transactions are processed by PayPal. Click here to donate with your Visa, MasterCard, American Express, or Discover card. You may donate using funds from your PayPal account by arranging for a transfer to donatewikimedia.org. Please make the check payable to “Wikimedia Foundation, Inc.” Please do not send cash through the mail. To move stock from your brokerage to ours, please give the broker our name, account number and our DTCC clearing number. When the transaction is complete, please email donatewikimedia.org so we can verify the transaction. If you require any assistance, please email donatewikimedia.org. Matching Gifts are a great, easy way to double or even triple your donation to the Wikimedia Foundation. To learn more about matching gifts or our involvement in the Combined Federal Campaign, please click here. If you have any further questions, please email donatewikimedia.org. We have an account at moneybookers.com. Please send donations to donatewikimedia.org.